Ladies and gentleman, if I hadn’t seen it with my own two eyes, I wouldn’t have believed it. I’m going to be honest with you, I really thought the Cubs were going to lose this game. No one gets this lucky. No one gets this many clutch hits. Sooner or later the breaks stop going your way. I wasn’t that disappointed, with the Cubs having won five in a row. But wait!!!! 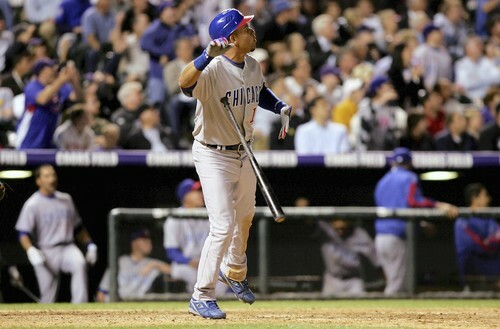 The Cubs were having none of that, came back, and stole a game from the Rockies. The Cubs won an unbelievable ballgame tonight, 7-6 in extra innings to become only the second team in MLB history to reach the 10,000 win milestone. If this is one of my beautiful Cubs dreams, don’t wake me up! Let me sleep!! I don’t even no where to start. How about the Cubs hitting to triples, one from Fukudome and one from Lee? How about Lee and Soto having four hit nights. How about that homer by Soto in that second? How about Rich Hill and the Cubs leading 3-0 in the bottom of the sixth before giving up five runs and going through four pitchers? out and one runner already in, before DeRosa lined out and D-Lee was doubled off second? That should have been the ballgame. All momentum should have gone to the Rockies. The Cubs should have just hung their heads and given up? But no, this team has fight. After Bob Howry set down Holliday, Atkins and Hawpe in order in the bottom of the eighth, the Cubs had one more chance to win it. Derek Lee started off the inning with a single. Then to the surprise of Len and Bob, every member of Cubs nation, and Derek Lee himself, Lou pulled him for a pinch runner, Felix Pie. No pinch runner was needed as Aramis jacked one to deep left center off of Manny Corpas, who blew a game the night before, to give the Cubs a 6-5 lead. Then, in the top of the tenth, Kip Wells took over for Corpas. Soto singled to lead off the inning and was lifted for pinch runner Mike Fontenot. Cedeno bunted to move Fontenot into scoring postition. Daryl Ward came in to pinch hit for Wood and was intentionally walked. With one out, Reed Johnson worked the count, but popped out to short left field. With two outs and his Canjun twin on second, RyanTheriot hit a single down the first base line, scoring Fontenot. Just to make things interesting, Carlos Marmol had to pitch the 10th and face Todd Helton, Matt Holliday, and Garrett Atkins, with Mark DeRosa playing first base!! No sweat for Marmol as he retired them in order and the Cubs win. This was an amazing game and I am just going to soak this up. My brother was at the game and will email me photos soon. Jason Marquis will take the hill tomorrow against the Rockies in a day game, 2:05 start.